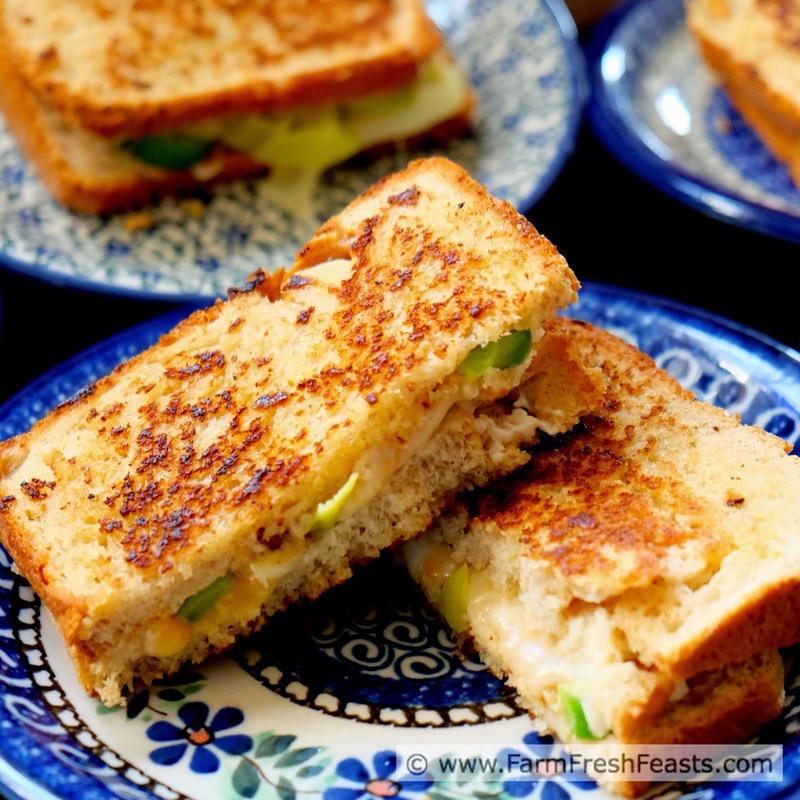 Two kinds of peppers--fresh sweet and pickled banana--with two kinds of cheese in this creamy vegetarian grilled cheese sandwich. I've not been one to follow food holiday trends [who came up with National Blueberry Pancake Day in the wintertime?] but I get why grilled cheese sandwiches are popular in Spring. It's sunny, yet it can be cool. A grilled cheese sandwich is the perfect lunch. This easy vegetarian sandwich would be terrific for a Meatless Monday supper, too. 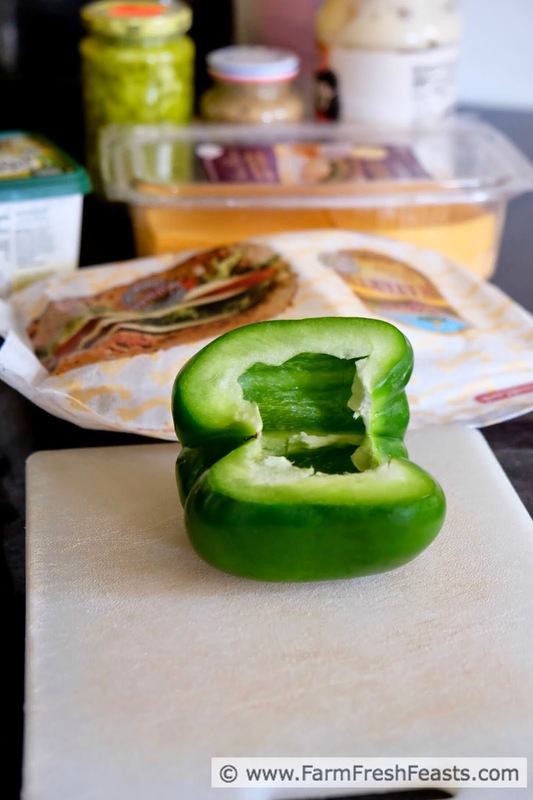 Shoot, if you slice the peppers during weekend food prep it's ready in minutes. If you don't slice the peppers ahead of time it's ready in minutes+2. I made a batch of these sandwiches one sunny-yet-cool Saturday lunch. I used both my Multigrain Sourdough bread as well as my spouse's German dark rye--it's good on both. The whole family appreciated the warm cheesiness. I'd say we all liked the peppers, but my daughter merely tolerated them. I got the idea the same lunch I head about Havarti & Chutney grilled cheese. At Tanks Bar & Grill I had the 'don't even think about asking for substitutions' grilled cheese. It had mayo, mustard, pickled banana peppers and some other stuff--but those listed parts resonated with me and I had to try them at home. For other grilled cheese sandwich ideas, plus a lovely tomato soup to dunk them in, please click on a photo below. This is one of my Clickable Collages of Recipe Suggestions--yet another way to give you ideas for what to do with your produce. Please refer to my Visual Recipe Index by Ingredient for further recipes by produce item, and follow me on Pinterest where I'm pinning cool things I find around the web. Preheat skillet over medium heat. Spread one slice of bread with mayonnaise and the other with mustard. 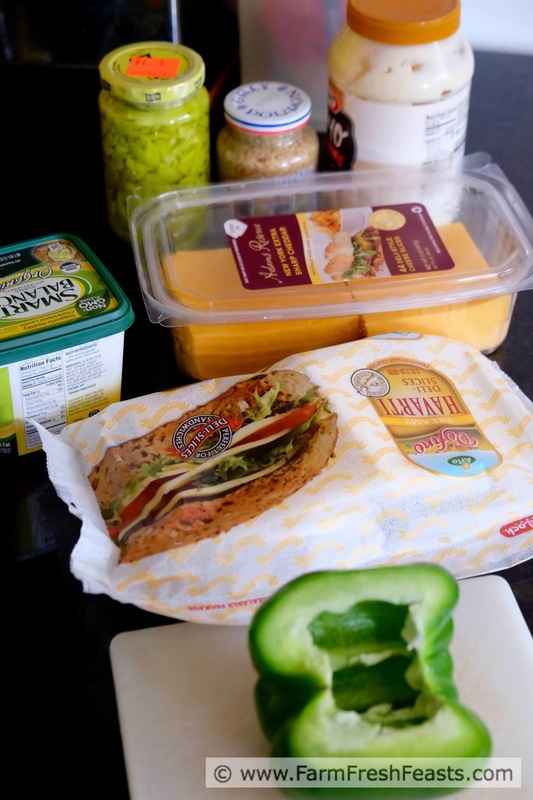 Top mayo-covered slice with pickled peppers, then cheddar, then Havarti, then fresh peppers before topping with mustard-covered bread, mustard side down. Spread buttery spread or butter on exposed bread, then flip buttery side down into preheated skillet. Spread buttery spread on exposed bread. After 3 to 4 minutes, flip sandwich over. After 2 to 3 minutes, remove from skillet, slice and serve. 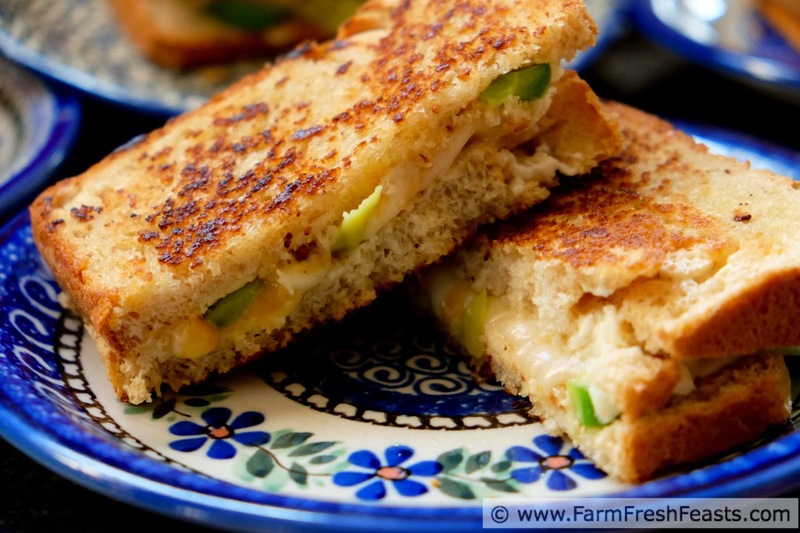 I absolutely adore a fantastic grilled cheese and this one looks super tasty! Peppers are mt favorite! 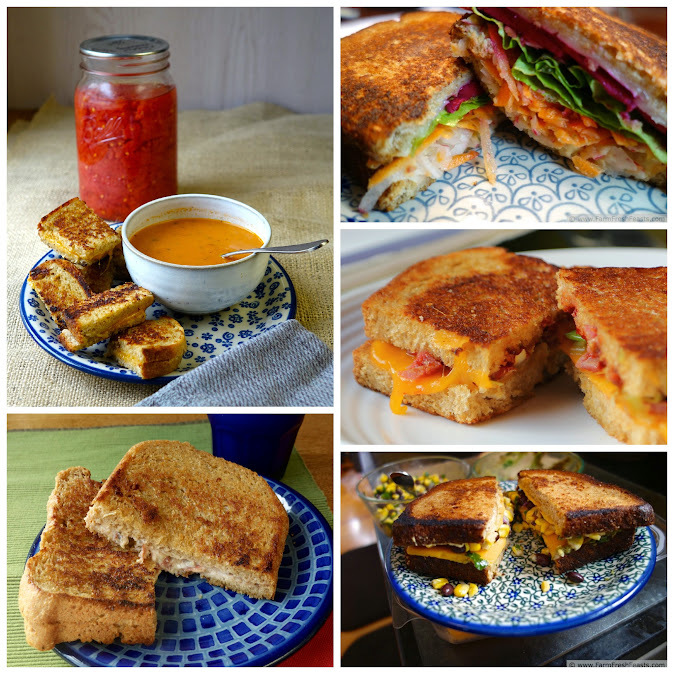 Grilled cheese is such an easy comfort food to whip up, and the variations can be endless. Oh my goodness, this is perfect! So great for a quick, weeknight meal! You're absolutely right--this meal can be made in minutes and it's so easy to have everything on hand. Whoever invented the grilled cheese sandwich was brilliant. This one looks fantastic. I agree--you could call her the inventor of comfort food. Oh heck yes. Major bonus points for the homemade bread! Sweet! Bonus points! Thanks--my bread machine does the work, but it's pretty easy to load and push the button and my kids love the result. Oh yum! 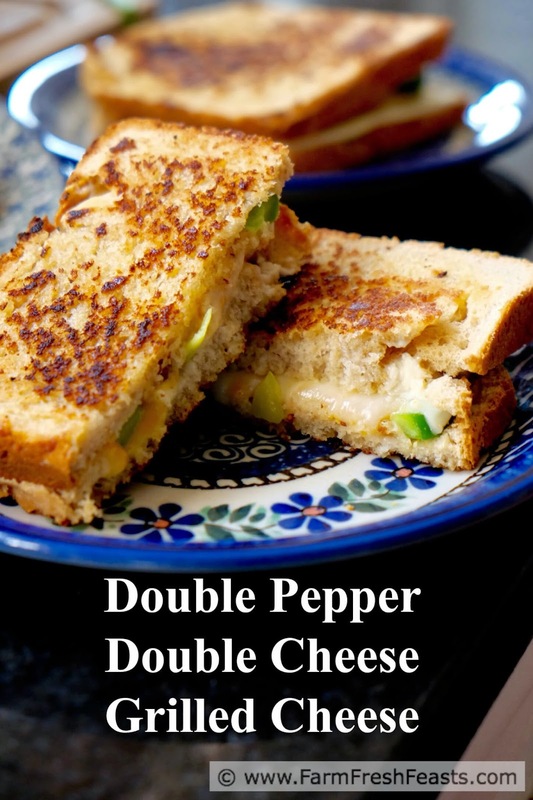 I love grilled cheese and the addition of those peppers sounds divine! Pinning! I try to add veggies into as many things as I can, so peppers is just another way to add a veggie into something I know we're going to eat. You just can't beat a good grilled cheese sandwich, and I love havarti cheese! I'm pretty tickled to find big Costco-sized packages of sliced Havarti. It's so nice for melting, and easy to use. And now I'm craving a grilled cheese. I love the addition of the spicy peppers here.